Think of a morning when you walked on a grass lawn or through a field. Did your shoes get wet? If yes, that is because the grass was wet with dew. 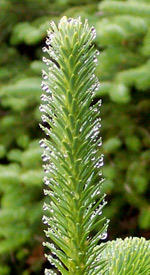 The dewpoint temperature is the temperature to which the air must be cooled, at constant pressure, for dew to form. As the grass and other objects near the ground cool to the dewpoint, some of the water vapor in the atmosphere condenses into liquid water on the objects. The dew point is reported by TV meteorologists and weather sites on the web because it is a great indicator of the air’s moisture content. As the dew point approaches air temperature, the air holds more water vapor. On a warm, humid summer day, the dewpoint may enter the upper seventies, but it rarely reaches 80 degrees. On cold winter days, dew point is often in the single digits. Usually dewpoint, air temperature and relative humidity are reported together, and these weather variables are indeed related. When air temperature equals dew point temperature, the relative humidity is 100 percent, and fog forms. Relative humidity is a relative measure of how humid the air is, the dew point temperature is an absolute measure of how humid the air. So while the dewpoint temperature is reported as temperature, it really informs us about humidity!